Yanda during Ravens practice, August 2012. 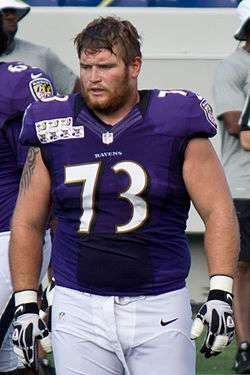 Marshal John Yanda (born September 15, 1984) is an American football guard for the Baltimore Ravens of the National Football League (NFL). He played college football at Iowa, and was drafted by the Ravens in the third round of the 2007 NFL Draft. With five Pro Bowl selections since 2011, Yanda is widely considered to be among the best offensive linemen in football. Yanda attended Anamosa High School in Iowa and was a letterman in football, basketball, and track & field. In football, he was a two-time first team all-conference selection. Yanda played for the Iowa Hawkeyes football team while attending the University of Iowa in Iowa City, where he was an economics major. He was selected as a third-team All-American by The NFL Draft Report in 2006 and earned second-team All-Big Ten honors from the league's coaches. Yanda's first two college football seasons were played for North Iowa Area Community College. Yanda was selected by the Baltimore Ravens in the third round (86th overall) in the 2007 NFL Draft. During his rookie year in 2007, Yanda played all 16 games with 12 starts. In 2008, Yanda was limited to 5 starts. In 2009, Yanda played all 16 games with 9 starts. In 2010, Yanda started all 16 games for the first time of his career. On July 26, 2011, the Ravens re-signed Yanda to a five-year, $32 million contract. In 2011, Yanda again started all 16 games and was chosen to represent the AFC in the 2011 Pro Bowl. In 2012, Yanda started 14 games and won his first championship ring as the Ravens won Super Bowl XLVII against the San Francisco 49ers. In the 2013 and 2014 seasons, Yanda played all 16 games per season respectively. On October 16, 2015, it was reported that the Baltimore Ravens had signed Yanda to a four-year extension worth $32 million. Yanda was ranked the #1 guard by Profootballfocus.com in 2015. Yanda married Shannon Hunt Yanda in 2011 and together they have three children. ↑ "Recent News on Marshal Yanda". Rotoworld. Retrieved 2011-12-31. ↑ "Marshal Yanda and Ravens agree on 4-year $32 million deal". Retrieved October 16, 2015.